Salmon in California have evolved to follow the seasonal rhythms of wet and dry periods as they migrate between their natal streams and the ocean, and then back again. The fall rains that swell Lagunitas Creek and herald the return of adult salmon to Marin County also encourage young coho salmon to begin their downstream journey to the ocean. In normal years, winter is the time when many of these young salmon migrate from headwater tributaries down to lower Lagunitas Creek, where they transform into silver smolts in preparation for the ocean phase of their life cycle. These smolts wait in the lower creek until April and May before entering the ocean, just in time to take advantage of the spring plankton bloom. 2013 and 2014 have not been normal years, however. Fall rains were infrequent and light, and January was the driest on record. The drought caused a significant delay in salmon spawning and resulted in a much smaller coho run than expected. The extended dry period did, ironically, seem to benefit the young salmon preparing to emigrate to the ocean. Many coho fry were unable to migrate downstream until the rain finally arrived in February, which meant that they weren’t packed together in lower Lagunitas Creek. The habitat in the lower creek can’t support very many young salmon through the winter, which appears to be one of the principal factors limiting the size of the entire coho salmon population. This year, salmon fry spent the winter spread throughout the watershed, and likely spent little time crowded in the lower watershed. The result was the largest emigration of salmon smolts yet seen in Lagunitas Creek. Biologists with the Watershed Stewards Project, the Marin Municipal Water District, the National Park Service, and the Salmon Protection and Watershed Network counted coho smolts every day between late March and early June as they migrated past traps on Lagunitas, Olema, and San Geronimo Creeks. In typical years the lower watershed doesn’t appear to be able to support more than approximately 11,000 juvenile coho salmon through the winter. 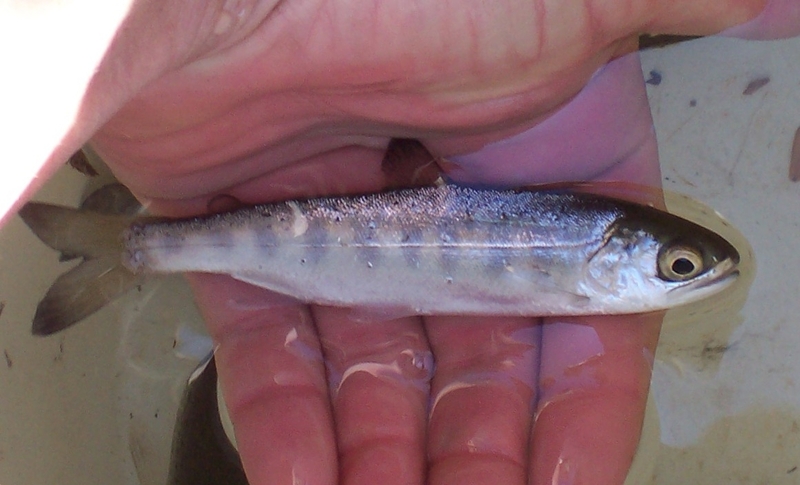 This year nearly 20,000 coho smolts emigrated to the ocean. What does this mean for the future of coho salmon in Marin County? In the short term, if food is abundant in the ocean we could see 2,000 adult coho return to Lagunitas Creek in 2015 (the most in more than half a century). On the other hand, this year’s smolts were fairly small and may not survive well. Over the longer term, while we can’t recreate this year and prevent coho from migrating to the lower watershed, we can provide more habitat there. A grant currently being considered by the California Department of Fish and Wildlife would fund the construction of five projects in lower Lagunitas Creek to expand side channels and floodplains for coho salmon winter habitat. Hopefully this grant will be funded and the projects will achieve their goals. As with the seasonal migrations of salmon, we’ll just have to wait and see. Coho season is wrapping up, and thankfully it’s ending with more of a bang than a whimper. In late January, at the typical end of the coho spawning season, the San Francisco Chronicle ran the headline “Crisis for the coho” with a couple of pictures showing the extremely dry conditions in the Lagunitas Creek watershed. As if on cue, the rain started falling a few days later and coho spawning took off. Since then spawning activity has subsided and in the last week we’ve seen what are likely the last few coho of the season. Our preliminary watershed totals are 433 coho and 203 redds, which is roughly double the size of the coho run three years ago. 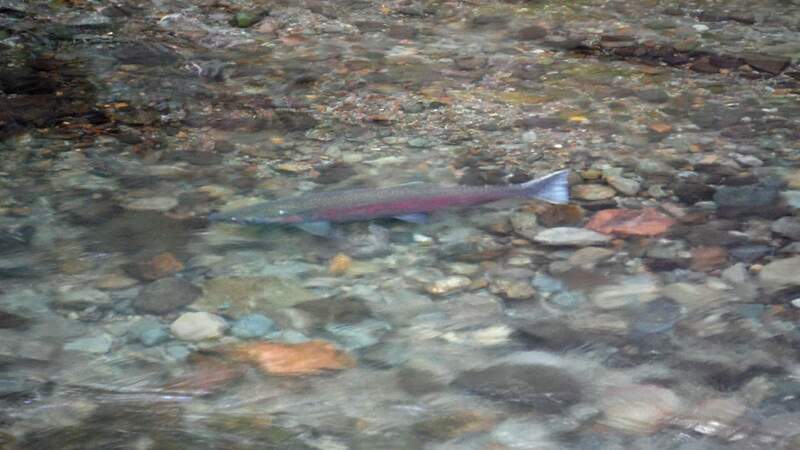 Steelhead (pictured) have also been spawning in impressive numbers. 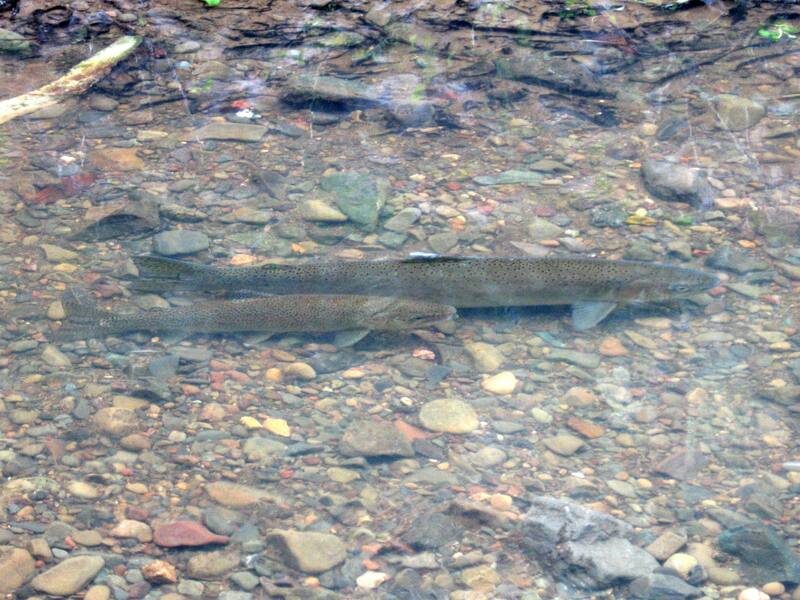 In the last three weeks MMWD biologists have seen 153 steelhead and 126 redds. Steelhead are likely to continue spawning through at least April, and at this pace we’re looking at a very good year for steelhead. Rain is forecast to return late next week, which should bring up another wave of steelhead spawners. The other big news was, of course, the enormous amount of rain we received. Since Friday the Kent Lake rain gauge has recorded over 11 inches of rain, while the gauge at the top of Mount Tamalpais recorded over 21 inches! 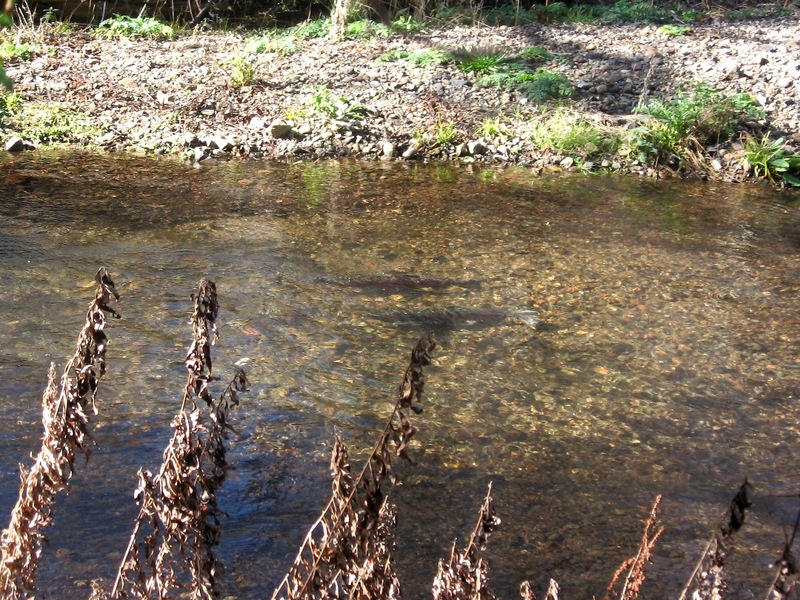 This has helped our water supply situation and has finally allowed salmon to swim into the tributaries. Flows are still too high and turbid to conduct surveys, but later this week we’ll be investigating how many salmon survived both drought and flood to return to these creeks at last. Finally some good news from Lagunitas Creek! Last Friday MMWD biologists conducted surveys to get a baseline salmon count ahead of a three-day increase in stream flows. This was the last “Upstream Migration Flow” of the season, and we wanted to document how many salmon spawned in response to the extra water. We were blown away to see significant numbers of salmon spawning throughout the creek before the flow even started. Apparently the 0.07″ of rain we received on Thursday was enough to encourage coho to finally spawn. In total we observed 118 live coho and 45 new coho redds. So far this season we’ve documented 252 coho and 103 coho redds. 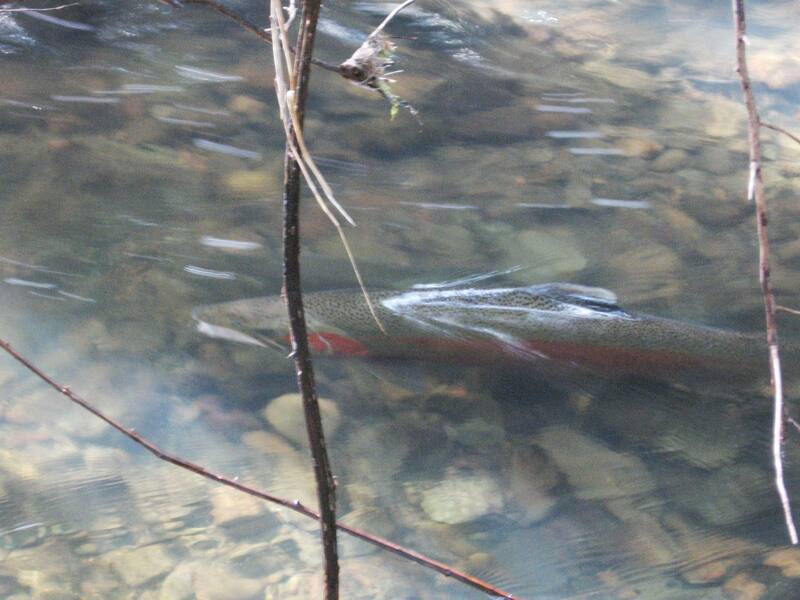 On Friday we also saw seven spawning steelhead and seven new steelhead redds. Finally, during a partial survey of Walker Creek (the next salmon stream north of Lagunitas Creek), we found the first coho redd and coho carcass of the season. The Upstream Migration Flow coincided with 0.8″ of rain on Sunday, and we’ll be documenting the salmon response in Lagunitas and Walker Creeks for the rest of the week. By next week we should have a pretty good idea how many salmon survived the last few months and finally spawned. Salmon spawning in Lagunitas Creek has remained muted, despite water releases from Kent Lake. On January 1-3 MMWD released approximately 29 million gallons of water to increase flows in Lagunitas Creek from 20 cubic feet per second (cfs) to 35 cfs. This “upstream migration flow” is intended to allow salmon to swim upstream through shallow areas and spawn, although it’s unusual for spawning activity to increase significantly when these releases don’t coincide with rain. We found 12 new coho redds following the flow, which was an increase from the previous week, but similar to the low counts in December (see chart). We also found a redd that was likely built by a steelhead, which was the first evidence of steelhead in the creek this season. This past week we surveyed all of Lagunitas Creek, nearly down to Point Reyes Station, and found ten new coho redds. To date we’ve observed 57 coho redds in Lagunitas Creek, which is exceptionally low for mid-January. A surge in spawning is still possible; back in 2001 we counted 96 coho redds in the second-to-last week of January. With no rain in the forecast that’s probably too much to hope for, but hopefully the forecast is wrong and rain is on its way. January has arrived and both rainfall and coho salmon numbers remain far below normal in the Lagunitas Creek watershed (see chart). 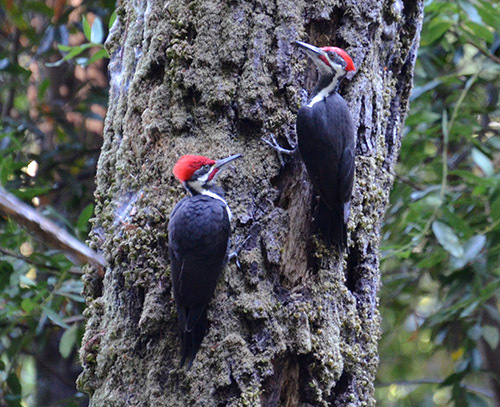 In the last two weeks MMWD biologists counted 15 new redds in the main stem of Lagunitas Creek. On Tuesday a school of 35 adult coho were seen in the “Swimming Hole,” a deep pool in Samuel P. Taylor State Park. That brings the season total to just shy of 100 coho (some of these were likely counted multiple times), which is far below the 400 fish typically seen by early January. Yesterday MMWD began releasing extra water to provide an “upstream migration flow” for coho salmon. Salmon generally prefer storm runoff for migrating upstream, but on occasion we’ve seen coho increase their spawning activity in response to these water releases. If the extra water doesn’t encourage a surge in coho spawning, there is some light rain in the forecast for late next week that might do the trick. We’ve seen spawning activity spike as late as the last week of January, but hopefully we won’t have to wait that long.